When Will Robotic Instructors Replace Online Professors? Some online college students often think their instructors’ responses to their weekly discussion forums, papers and email queries were all written by a robot. In my discussions with a few students, it appears their thinking was based on the instructor’s failure to engage with them and a lack of concern for their progress. For example, personal emails about textbooks or about their confusion about how to complete a written assignment went unanswered. “Is that a robot or just a lazy professor?” they joke. But the sense of robotic teaching was real. They also felt that the robotic instructor represented the university as a whole. Some new online instructors have told me they do feel like robots. They see that weekly announcements are written for them in advance and programmed to go out to students. Even discussion summaries of the past week’s work are already prepared and ready to be sent to each student. They summarize what the students have just finished discussing among themselves the previous week. These instructors see that when students are asked to respond in a discussion forum, generic questions or replies have been prepared in advance by the professor even before the course begins. Over time, robotic instructors amass numerous generic questions and replies for copying and pasting into student reply boxes. As a result, every student in the discussion forum gets the same impersonal response, such as “What is your personal experience with this week’s problem?” or something similar. There is a solution to being a robotic instructor, however. It involves learning to engage students. Those canned responses that instructors use are only there as a starting point for teaching. To truly contribute to each student’s education, the instructor must read and respond to each student’s unique background and to specific answers, questions or issues in online discussions. These new “robotic instructors” need to get to work; they have not yet figured out how demanding online teaching is. They need to have enough time to read their students’ stories, essays and discussion topics and then tailor their responses accordingly. How Many Jobs Will Be Replaced by Robots? Robots in our society are becoming commonplace. For instance, robots have taught students how to perform science, technology, engineering and mathematics (STEM) activities. Similarly, robots are routinely found in factories doing jobs once performed by men and women. Increasingly, autonomous transport vehicles are gaining popular acceptance along with drones that deliver medical supplies, mail and even food. Robots vacuum our floors and patrol our armies’ battlefields. There is growing concern that robots or AI systems will eventually replace people as workers. In 2018, I was a member of an American Public University debate team, discussing the topic, “Technology and Automation Are Going to Cause an Unemployment Crisis.” I was also part of a team of professors discussing the impact of artificial intelligence and robots at the yearly Dupont Summit organized by the Policy Studies Organization. Audiences at both events spoke of their fear and concern about robots and AI replacing humans in the online classroom and elsewhere. What Are the Concerns Regarding the Use of Robots? Many people fear that automation will replace them in their jobs. They worry about how they will make a living if a smart communications app or an AI device replaces them. But this is an old story. Machines have been replacing human workers since the Industrial Revolution of the 19th century through the advent of the computer age in the 20th century. In education, AI software has helped online instructors do their job faster and better. Microsoft Word, for instance, automatically corrects misspellings. How we humans work with automation, robots and smart machines is the question. Can AI do what we do? Can these algorithms be innovative and come up with new ideas and solutions to problems? AI or robots do not have that human touch. While they may be able to solve problems, the human factor that makes solutions palatable to people in distress is missing. Could a robot be as compassionate as your doctor when he tells you that you have a serious disease? It seems unlikely. In the 1950s, British computer scientist Alan Turing devised the Turing Test. It was an early method of deciding whether a human or a robot was better at answering questions. In the Turing Test, a man was placed in one room and a computer in another. Each was asked a series of questions. An unbiased umpire then assessed which answers were the computer’s and which were the man’s. So far, today’s computers have not passed the Turing Test, but they have come close. In 1997, an IBM computer called Deep Blue defeated the reigning world chess champion, Garry Kasparov. The six-game match ended with two wins for IBM, one for the champion and three draws. But that close result could now change with the development of today’s artificial intelligence. Ask a dean or provost if a robot can teach an online college course. The response will be either laughter or your question will be ignored. The impact of the Internet and social media on communications today was not anticipated in the early days of their maturation. 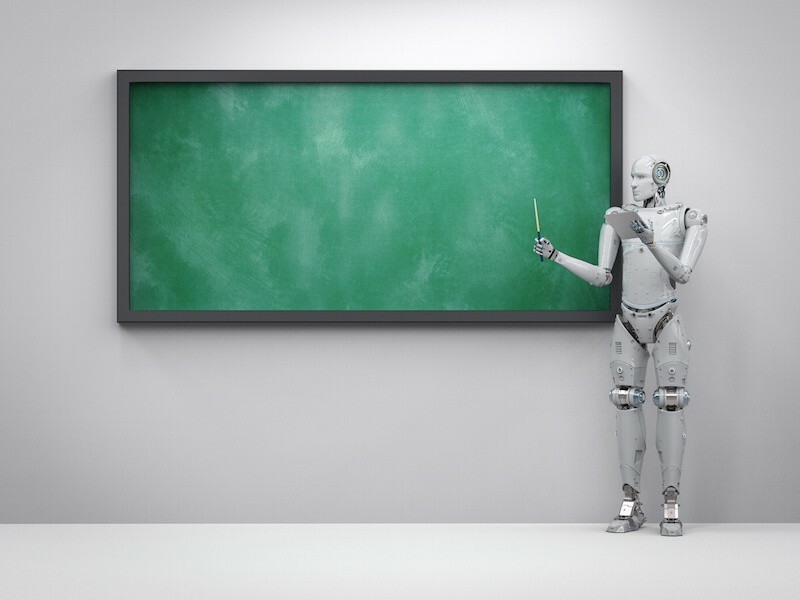 Maybe now is the time to test the potential of robots teaching an online course, where students do not have to be in physical proximity to the professor. Why not a modern Turing Test for some online college course between a human professor and a robotic online instructor? The results should be most interesting. #APU expands access to quality #highereducation & prepares our students for #service & #leadership in a diverse & global society.